Home ownership is a little like an arcade game. Moles in your yard? Just grab a padded hammer and play whack-a-mole! If you’re any good, you’ll get at least three but chances are, they’ll pop right back up! That’s right, moles are pesky and once they invade your space, it’s incredibly hard to get them out! This is why it’s important to call Minnesota Wild Animal Management Inc., your wildlife removal company that packs more than just a measly, little padded hammer! If you live in Ham Lake, MN and need wild animal removal, you’ve reached the right place! The process is simple, if there is a wild animal problem, we can help! There are no long waiting periods, your problem will be handled immediately. For wild animal removal, give us a call anytime, day or night. We will come out and inspect the area and provide you with an affordable quote that details our plans for removal. We will then remove the nuisance, repair the damage, and prevent the animals from coming back! All of our services are backed with a four-year warranty, the strongest in the pest control industry! These little critters can be adorable in a museum and behind glass, but when they tear up your yard and start to cause some real problems, you won’t think they’re that cute anymore. 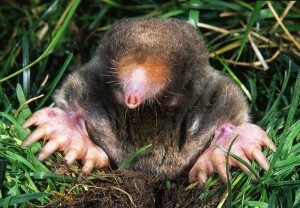 Moles love to burrow and it’s basically all they do, with the exceptions of eating grubs. In just a few short hours, one more can build a tunnel 60 to 80 feet long! While they don’t intentionally destroy root systems and your beautiful garden, their tunneling can ruin it in the blink of an eye. Moles are generally hard to remove and hard to discourage from returning. At Minnesota Wild Animal Management Inc., we have been dealing with moles for many years. We know the tricks and trades of moles and can ensure you that all of the moles around your property will be removed and deterred from coming back. Serving all of Ham Lake, MN, Minnesota Wild Animal Management Inc., is here to handle all of your wild animal removal needs. If you have moles, call a wildlife removal company you can count on! Our emergency line is always open! Call us today at (612) 237-8282 and leave whack-a-mole up to the kids in the arcade.